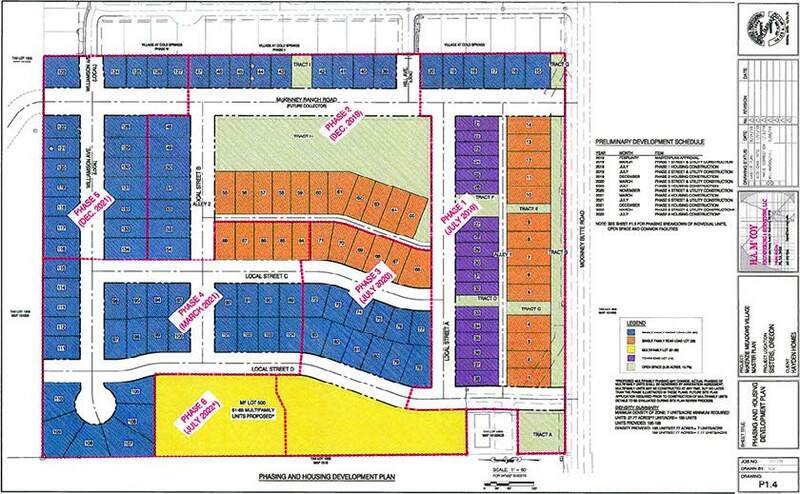 Sisters planning commissioners will hear a proposal for nearly 200 new houses in town this week. The 29.57 acres designated as McKenzie Meadows Village (MMV) since its annexation into the city in 2006, is the subject of a Planning Commission public hearing scheduled for Thursday, March 7, 5:30 p.m. at Sisters City Hall. Hayden Homes is requesting approval of a Master Plan Development (Type III), Comprehensive Plan Map and Zoning Map Amendment (Type III/IV), Tentative Subdivision (Type III), and Development Agreement. Approval would enable development of a minimum of 195 residential units - 116 single-family detached, 18 single-family attached/townhomes, and 61-65 multi-family units - as well as 3.35 acres of open space and recreational amenities and supporting infrastructure. The request also includes a Zoning Map Amendment to relocate 1.8 acres of an Open Space zoning district within the project site. In the original MMV Master Plan, that 1.8 acres was set aside as a park. Hayden wants to move it to a different location in an effort to save more trees in a more densely treed area. One final request is consideration of a Development Agreement (DA 19-01) to address specific terms related to the provision of affordable housing units (AHU). In 2009, the Planning Commission and the City Council attached two stipulations to the property. One directed that one in every 10 housing units would have to be affordable housing. Affordable housing is defined as housing in which low-income residents spend no more than 30 percent of their gross household income on housing-related expenses. A low-income person or household earns 80 percent or less of the median family income for the area. In a September 4, 2018 Nugget article, it was reported that Hayden planned to build the 20 AHUs as First Story homes (Hayden's 501(c)(3) nonprofit). Those homes would be offered at market rate with a 20-year deed restriction. First Story would offer a 30-year no-interest loan to each of the buyers. According to the proposed Development Agreement coming before the Planning Commission, the City of Sisters, McKenzie Meadows Village, LLC (the owners), Hayden Homes, LLC (the buyer), and First Story (the developer), agree that First Story will develop the AHUs on the property in accordance with the amended and restated Annexation Agreement obtained in May 2017 by McKenzie Meadows Village. The amended Annexation Agreement removed the prescriptive nature of how the AHUs would be provided. The original provisions dealt with affordable housing for seniors, called for affordable units to be evenly distributed throughout the property, and related to housing styles, sizes, and design types. Those restrictions are not part of the 2017 Annexation Agreement. Hayden's AHU exhibit in the new Master Plan for MMV indicates nine AHUs will be part of Phase 1. It appears they will be similar to the 400- to 600-square-foot units along McKinney Butte Road in the Village at Cold Springs. The other 11 AHUs will be part of Phase 3, located on a parcel of land on the western edge of the property next to the high school parking lot. Those are marked as rentals. According to the proposed Development Agreement, Hayden Homes will contribute $50,000 to the City of Sisters Affordable Housing Fund, with $25,000 to be paid within 60 days after expiration of the Termination Right. The remaining $25,000 will be paid within 365 days of the first payment. If a Construction Excise Tax is later adopted by the City, MMV would be exempt from that. The other stipulation in the original Annexation Agreement required that the proposed senior living facility had to be constructed and open for occupancy before any other construction could begin in the development, which eventually lead to a number of LUBA appeals, long delays, and expiration of permits, resulting in listing of the property for sale by the local Willitts, Kallberg, and Reed families, long-time owners of the property. The original Master Plan for the entire MMV was approved in 2010. Now, nine years later, with over $600,000 in legal fees paid out by parties involved, a new Master Plan for development of the property by a different builder is coming before the Planning Commission. Gone are plans for the senior living facility, low-income senior apartments, a smattering of single-family housing, cottages designed for independent seniors, and a clubhouse that would have served multiple purposes for both the residents of MMV and the greater Sisters community. The packet of information produced for Thursday's hearing is well over an inch thick, with a large collection of emails and letters from members of the public who seem to have two or three major concerns about the proposed Hayden development. Residents of the original three phases of Village at Cold Springs (another Hayden development), which abut the MMV property, are opposed to two of their streets, Williamson and Hill, connecting to streets in MMV. They cite safety concerns with increased traffic and cost of maintaining their private streets as the two biggest issues. The City permitted Hayden to put in streets narrower than what is required by code, provided the homeowners assumed responsibility for maintenance and repair of those streets. The Village at Cold Springs homeowners' association claims because they are private streets, the public shouldn't be able to travel through their development as a short-cut or a way to avoid traffic on McKinney Butte Road. They don't want the streets connected. Looking at the same traffic studies, transportation engineers encourage connecting the streets to create a grid system of connectivity that reduces heavy traffic loads on one or two streets by providing a number of alternative routes. City Manager Cory Misley, with only three months on the job, admits there are no easy answers to these concerns. "Our job at the City is to administer the City code as it is written at the time. When reading and interpreting the code, some areas are black and white and some are gray. The gray areas require interpretation. The interpretation involves conversations with our land-use attorney and among the staff. As a team, we provide alternatives to the Planning Commission and the City Council, who eventually are responsible for making the final decisions," Misley said. "We can't discriminate against or favor applicants who submit their plans to the City. There is no litmus test we can administer to determine who deserves to receive permits and who doesn't. If everything meets the requirements of the City codes, then they get approval," Misley added. "The staff's job is to review the codes and be certain they are up to date and relevant and that loopholes are closed. Recommended changes are brought to the Planning Commission and City Council for approval," he added. The codes are dynamic, changing over time. Misley concluded by saying, "At the City, we don't want to cut corners or avoid making tough decisions now by putting them off to a later date. We are a small city with a limited staff, at a time of unparalleled growth. It can be challenging to keep up with that growth, and the staff is working hard to do that." The packet of materials for the hearing is available at www.ci.sisters.or.us.